Please take a second to admire our brand new graphics that demonstrate all of our areas of service. As always we offer our first class NYC residential cleaning service , NYC commercial cleaning service, NYC painting service and NYC handyman service. However, please note that we have added a brand new section covering our NYC Facilities Maintenance division. We offer a full range of services to retail stores including porter and janitorial services as well as maintenance and handyman services. Please look around and do not hesitate to contact us with any of your commercial or residential needs. Additionally, please remember to check back with us because we will be updating this portion of the website frequently with important news and great offers. It’s been awhile since I’ve written a blog post, but I had to take the time to post this item that is crucial for pretty much everybody these days. DO NOT, I repeat, DO NOT use a normal household cleaner (i.e. 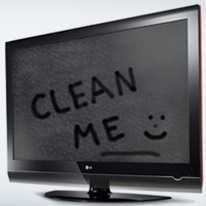 Windex or Fantastic) on your computer monitor, plasma, LCD or LED screen! Here’s the scenario: You’re sitting at your desk working away and you suddenly realize you’ve eaten way too many Drake’s Coffee Cakes at your desk without as much as wiping away the crumbs. You immediately jump into action and run to grab a large roll of paper towels and some Fantastic. You wipe down the entire desk and it looks a million times better and you’re about to walk away with a feeling of accomplishment. However, out of the side of your line of vision you glance at your computer monitor and realize that your job is far from over. STOP!! If you take that Fantastic and paper towel to your monitor your might as well call it a day right there because you’re not getting any work done through that cloudy monitor. Attached is an informative article from about.com about the proper way to accomplish this deceptively tricky task. Of course, you can do this yourself. However, when in doubt leave it to the professionals! So, there’s a new Federal EPA law that pertains to lead paint. There appears to be a fair amount of confusion about it and the information wasn’t exactly disseminated to the public expeditiously, but the bottom line is that starting April 22, 2010, certain requirements must be followed in buildings built pre-1978. Federal law requires that “contractors performing renovation, repair and painting projects that disturb more than six square feet of paint in homes, child care facilities, and schools built before 1978 must be certified and trained to follow specific work practices to prevent lead contamination.” Please take a look at the EPA site with all of the information. On one hand, this does have the potential to increase costs for both homeowners and contractors, but the flip side is that it does have the potential to save lives. Lead paint should be dealt with by a professional in order to prevent any potential damage. I didn’t know much about lead paint but apparently it was widely used for many years. The Wikipedia page says that lead paint was used to “speed drying, increase durability, retain a fresh appearance, and resist moisture that causes corrosion” the one catch is that it’s extremely toxic! 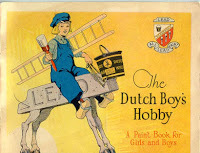 There is ac tually an interesting story about how the Lead Industry Association and paint manufacturers ran an advertising campaign throughout the 20s up to the 50s playing down the hazards of lead paint. In fact the Dutch Boy is actually a small boy messing around with lead paint. I found that fact in this article, along with other interesting facts about lead paint. If you look in the top right corner of the photo it says All Lead Paint. I also like his yellow clogs! The bottom line is that I became lead certified as did most of our handyman staff, plus we are a Lead Safe Certified Firm. We know how to take the proper precautions in the most cost-effective manner we can. We were already following most of the requirements without even knowing it.